This award recognizes the teaching contribution by a lecturer, full-time faculty lecturer or full-time lecturer. The recipient constantly strives to improve his or her teaching performance, to create an environment conducive to students' intellectual development and to instil in them the desire to excel and work hard. The award winner is recognized by his or her peers and students as an exceptional teacher. 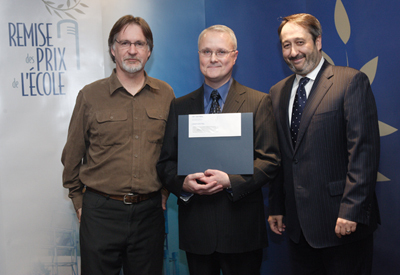 Winner: Pierre Lainey, Full-time Lecturer (Management), Certificate Programs Department. Jean-Pierre Dupuis, Director of the Department of Management, representing the Director of Certificate Programs, Jean-Pierre Béchard, who could not attend the award ceremony, Pierre Lainey, winner, and Michel Patry, Director.